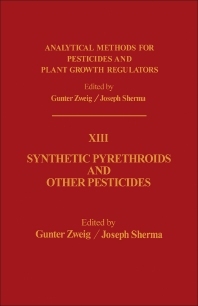 Analytical Methods for Pesticides and Plant Growth Regulators, Volume XIII: Synthetic Pyrethroids and Other Pesticides covers the important role of the synthetic pyrethroids as pesticides. The book discusses discussion the analytical methods used for synthetic pyrethroids. The text describes analytical methods for carbaryl, diflubenzuron, asulam, betasan, diuron, eptam, fluometuron, propanil, and Sutan. A detailed description of methods of analysis for technical-grade products, formulations, and residues of pesticides is also provided. Toxicologists and people involved in the analysis of pesticide formulations will find the book invaluable.